At a time when Brexit has prompted the greatest change to farming in a generation, the Yorkshire Food and Farming Rural Network has joined other regional food and farming stakeholders to promote a positive vision for the future of the industry. Collaboration will be key to Grow Yorkshire, an initiative supported and enabled by the York, North Yorkshire and East Riding Local Enterprise Partnership. 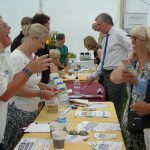 The platforms goal will be to inspire and support farm and food businesses in North and East Yorkshire. Grow Yorkshire aims to prepare farming and food businesses for inevitable change, spread the message that profitability is possible, signpost available support and inspire rural business owners with real, relatable stories of other farmers’ successes. As Common Agricultural Policy subsidies are phased out, this focus on increased productivity and profitability will prove critical. However, Grow Yorkshire stakeholders are convinced that Yorkshire’s entrepreneurial, innovative and resilient spirit makes the region the ideal place to launch such an initiative.